(Global News) A JAMA study has found that the flu vaccine, taken by 60% of people over 65-years-old, may be killing a significant number of senior citizens. Often when an article about the dangers of a vaccine comes out, there are people who write in to tell about a family member who was harmed by the vaccine, and the flu vaccine for senior citizens in no exception. A number of people have written to report that their grandmother, or uncle, or brother died shortly after getting a flu shot, sometimes after receiving their first ever such shot. Their stories are frequently minimized, yet the government pays out more compensation from the flu vaccine than any other vaccine. Despite this, it is increasingly expected that every senior citizen line up for their annual flu shot. 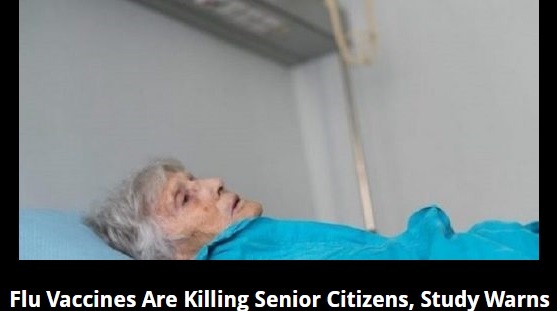 A nursing home near Atlanta, Georgia, now reports a devastating outcome to such a policy, according to Health Impact News. All of the residents of the Hope Assisted Living + Memory Care were given a flu vaccine on Friday, November 7. Every one of the senior citizens developed an immediate fever. Within the week following, five of them died. The source reports that the facility’s typical pattern is one or two losses every six months, frequently due to Alzheimer’s.